Antonio Gramsi (22 January 1891 - 24 April 1937) was an Italian Socialist and then Communist editor who is best known for his notebooks of reflections that he wrote while in prison. (1). Gramsci grew up on the Italian island of Sardinia and saw the poor conditions of the impoverished peasants there. He studied just before the First World War at the University of Turin at a time when industry, especially the Fiat auto company was starting. Gramsci became concerned with the conditions of the new industrial working class. When the First World War started, he was asked to join a new Socialist newspaper that had started in Turin. 1921, in part due to the Russian Revolution, the Italian Communist Party was born. 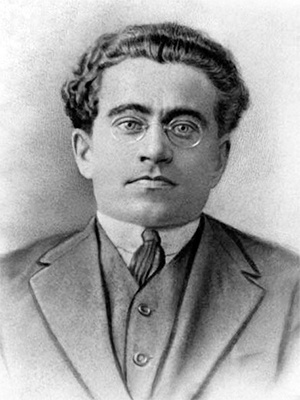 Some of the Socialists, including Gramsci, joined the new party, and Gramsci became an editor of the Communist newspaper. In 1922, he went to Russia as a delegate of the Italian Communist Party to a convention of Communist Parties from different parts of the world. In 1923 Benito Mussolini and his Fascist Party came to power and quickly began a crackdown on the Communists and other opposition movements. In 1926, after a failed attempt on Mussolini's life, there was a massive crackdown on Communists. Although he had nothing to do with the effort to kill Mussolini, but as a Communist deputy to the national Parliament, Gramsci was sentenced to 20 years in prison. His health, which had never been strong, deteriorated in prison. On 27 April 1937 he died, aged 46. While in prison, he wrote his ideas in notebooks which were censored by the prison authorities. Then the notebooks were passed on to family members. Gramsci had to be careful about how he expressed his ideas. The notebooks were published only after the end of the Second World War and the defeat of the Fascist government. Thus Gramsci was never able to discuss or clarify his views. Nevertheless, his prison writings have been widely read and discussed. The concept most associated with Gramsci is the idea of "hegemony". Hegemony is constructed through a complex series of struggles. Hegemony cannot be constructed once and for all since the balance of social forces on which it rests is continually evolving. Class structures related to the mode of production is obviously one area of struggle - the core of the Marxist approach. However, what is new in Gramsci is his emphasis on the cultural, ideological, and moral dimensions of the struggle for hegemony. For Gramsci, hegemony cannot be economic alone. There must be a cultural battle to transform the popular mentality. He asks "How it happens that in all periods, there co-exist many systems and currents of philosophical thought and how these currents are born, how they are diffused and why in the process of diffusion they fracture along certain lines and in certain directions." Gramsci was particularly interested in the French Revolution and its follow up. Why were the revolutionary ideas not permanently in power but rather were replaced by those of Napoleon, only to return later? Gramsci put an emphasis on what is called today "the civil society" - all the groups and forces not directly related to government: government administration, the military, the police. There can be a control of the government, but such control: can be replaced if the civil society's values and zeitgeist (world view) are not modified in depth. There is a slow evolution of mentalities from one value system to another. For progress to be permanent, one needs to influence and then control those institutions - education, culture, religion, folklore - that create the popular zeitgeist. He was unable to return to the USSR to see how Stalin developed the idea of hegemony. The intellectual contribution of Gramsci has continued in the work of Edward Said on how the West developed its ideas about the Middle East. (2). Likewise his influence is strong in India in what are called "subaltern studies" - what those people left out of official histories think. As someone noted " I believe firmly that the history of ideas is the key to the history of deeds."